“A house divided in itself is not worth it” was said two thousand years ago. Our common house-the House of culture was divided by a fundamental contradiction: science-art. Will it stand before the big challenges of the present and the near future, the contours of which are already clearly marked? These are challenges of the sixth technological way with full robotics, total artificial intelligence and big data, digital economy with smart and “Transparent” environment (smart things, houses, cities). In our eyes there is a rapid complication of the environment of human existence, the complexity of which ceases to hold them, and the speed of changes occurring in this environment, already exceeds its adaptive capabilities. As a result, many forms of physical and intellectual activity are alienated from a person, and he himself realizes himself as a “weak link” in his own technosphere. The situation is also aggravated by the fact that the complication of the external environment, the person responds to the simplification of the self-structure, the introduction of artificial intelligence and big data-is recalled by the clique thinking, and the clever man does everything around, Except himself. The Conference considers it important to raise the following questions of principle. What is the difference between man and artificial intelligence and can this difference become a competitive advantage of man? Is it possible to change a person's reaction to big calls in the opposite way as above? What forms of activity of consciousness are inalienable from the person, and how they are connected with art? Is it possible to see in contradiction science-art a single force field of high tension, and the energy of this field to use for qualitative transformation of the general cultural situation? 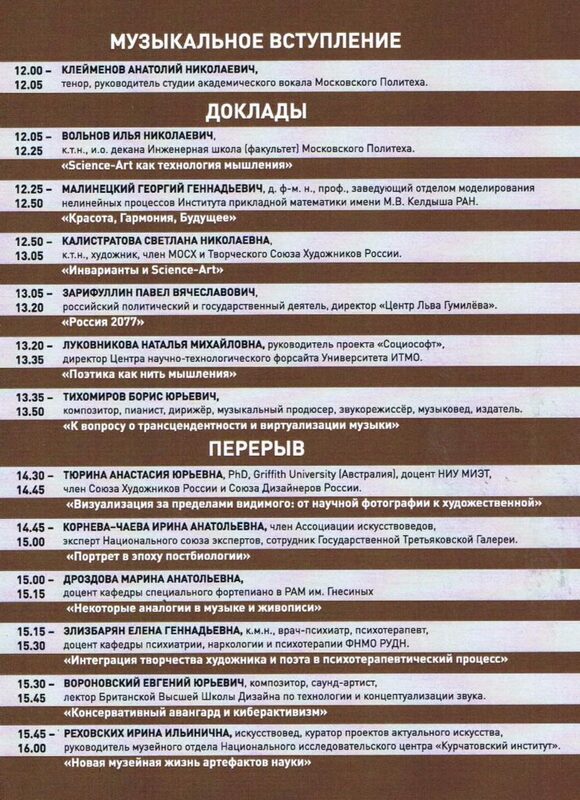 These and other questions will be discussed at the Conference within the framework of the personal exhibition of the artist Svetlana Kalistratova “invariants. Intersections “, whose works under the general name” invariants “could be considered as an artistic evidence of the eternal properties of infinite space, contrary to modern innovation in solving short-term local tasks Utilitarian orientation. The creativity of Svetlana Kalistratova is semantically saturated and presupposes the possibility of a large number of variants of its unpacking, which in turn gives the spectator the freedom of the interpretive motion of his thought in this almost infinite space Possible. It is difficult to imagine more favorable conditions for the work of the Transdisciplinary conference on the single scientific and artistic attitude to reality and the statement of fundamental questions of the future culture and human. Next: Next post: Good question. Why is Pablo Picasso a great artist?